These heishi beads are made from Natural Grey Oyster sea shell which were hand picked from the beautiful beaches in the Philippines. These are a nice color of red round smooth coral beads. The size varies from 3.5mm to 3.7mm. Unsure if these have been enhanced. Genuine Coral Gemstone. 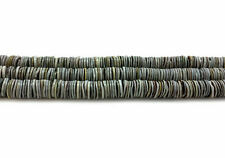 Beads Per Strand: 117 beads. We have been importing gems for 30 years directly from the gem cutters. Natural Queen Conch Shell with Fine Polished. -Graduated Heishi Round Disc. - Size Approx: From 7~8mm to 17~18mm. Natural Shell Material . - 1.2mm Hole Drilled Vertically. - Creative shape for design use. Color: Dark Aqua Blue with Gold Overlay Drawbench Drizzle. Chief sources of mother of pearl are the pearl oyster, freshwater pearl mussels, and abalone. It is very strong, resilient, and iridescent. 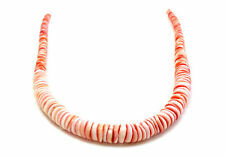 • size: 12mm x 18mm • quantity: one 16" strand • type of gem: dyed coral • item SKU: s145. You will receive 1 Vintage Genuine Light Pink Shell Hand Carved Rose Flower Cameo. Smooth Flat Back with Half Drilled Hole. Flower Rose measures 11mm. Round by 4.5mm. High, Hole Approx. .5mm (does not go all the way through) Each Handmade Bead is Unique and May Vary in Size & Color Slightly. New Unused Vintage Stock - NOS - New Old Stock. Quantity: 1 Strand. Style : Loose Beads. Colors may appear different on each computer monitor. Most issues can be resolved with simple communication. length: 15 ". This piece of art is hand made in the beautiful island of the Philippines. • size: 25mm - 30mm • quantity: 15 beads • type of gem: seashell • item SKU: d110. Type: Cabochon CAB. Stone Type(s): Natural Buffalo Bone. Rainbow Cal. Lapis Lazuli. Weight: 1.000017 gram. Drilled: Not Drilled. Quantity: 1Pc. 17mm Conch Natural Sea Shell Gemstone Beads Strand Jewelry Making 15"
Gemstone Beads. Agate Beads. Citrine Beads. Coral Beads. Fluorite Beads. Garnet Beads. Size : 17mm. Lemon Stone. 5 out of 5 stars - 17mm Conch Natural Sea Shell Gemstone Beads Strand Jewelry Making 15"
2 product ratings2 product ratings - 17mm Conch Natural Sea Shell Gemstone Beads Strand Jewelry Making 15"
15x Pink Shell Round Lotus Beads. The beautiful Round Pink Shell Round Lotus Beads are great for all kinds of jewelry,handcraft. Special design,you can DIY your bracelet or necklace. Type:Pink Shell Round Beads. SIZE: approx 28mm 26g/10PCS. MATERIAL: shell. We are wholesaler. Natural Coral Gemstone Rice Spacer Loose Beads Red Orange Pink 3mm 4mm 6mm 16"
Our Pink Luhuanus shell heishi beads are the finest that an artist could ever ask for. These beads are natural and the Pink Luhuanus sea shell used to make them are hand picked from the beautiful beaches of the Philippines. Natural Queen Conch Shell with Fine Polished. - Size Approx : 4mm. - Thickness : 4mm. - 0.8mm Hole Drilled Vertically. - Round Bead. Natural Material . - Classic shape for design use. Smaller size, tube like beads and nice quality. The color is natural and they have good shiny polish. Great for earrings and bead crafts. These are NOT bamboo "coral". These are very nice at a good price.